Imagine this for a second: there is a job that allows you a ton of creative freedom. Now get this: pays extremely well too. And almost every company in America–actually, the world–needs one on their team. Yes, the job is a graphic designer. Searches for examples of graphic designer jobs and resumes are in the tens of thousands a month. So I looked at 100+ job posts to figure out what skills they want a graphic designer to have. If you are not a master (or plan to become a master) of Photoshop, Illustrator, and InDesign, you should probably start now. It is an essential graphic design skill and there is no way to avoid it either. Almost every job post required applicants to be well versed in using those programs. 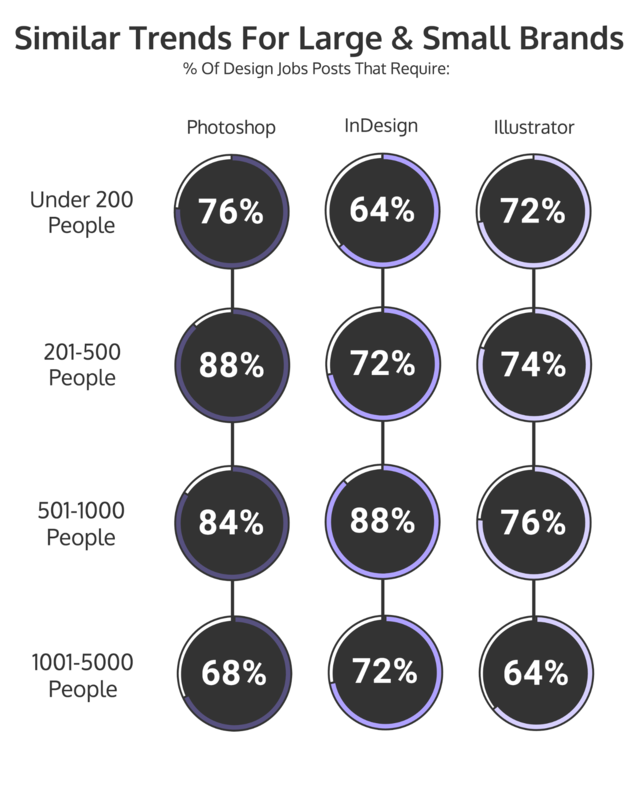 In fact, Photoshop, Illustrator, and InDesign are the most requested skill in our sample of job postings. Like, they blew the others out of the water. Out of the 100 job posts that I studied, 76 required Photoshop, 74 wanted Illustrator, and 74 needed InDesign. And most wanted all three! The need for these three graphic design skills far outpaced other popular ones by a large margin. The next most popular skills were Adobe Creative Suite, Microsoft Office Suite, and HTML. 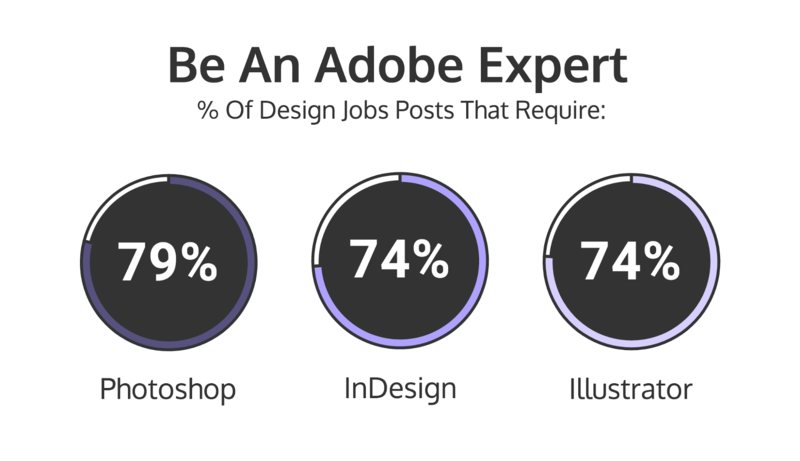 That being said, none of those skills passed the 40% mark, which confirms our notion that Adobe skills are essential if you would like to be a designer in 2017 or beyond. And I mean way beyond 2017, Adobe has dominated this space for the past 20 or so years, and it does not look like that will be changing any time soon. Additionally, it did not matter what size company you want to work for–they followed the same trend. Which further shows that these are the cornerstone of any graphic designer’s skill set. I did notice that companies with more than 1000 employees, the demand for the three Adobe programs dropped a bit. I think that can be attributed to most of the large companies assuming you already have these skills. Even outside sources seem to confirm our findings, with the GDUSA stating that those three programs are requested by most employers. Which is always good. And if you plan to become a graphic designer in the future, I would recommend learning the basics of each of them. These are baseline graphic design skills and if your portfolio does not show off your skills in each, I would not even try applying. Now if you need still don’t have a website, check out these website builders for designers! HTML was one of the most popular skills in my study of marketing skills from earlier in the year. Both my data and the experts I consulted agreed that to survive in 2017 and beyond, being familiar with HTML is key. This idea is echoed when I looked at the graphic design skills, to almost a greater extent. 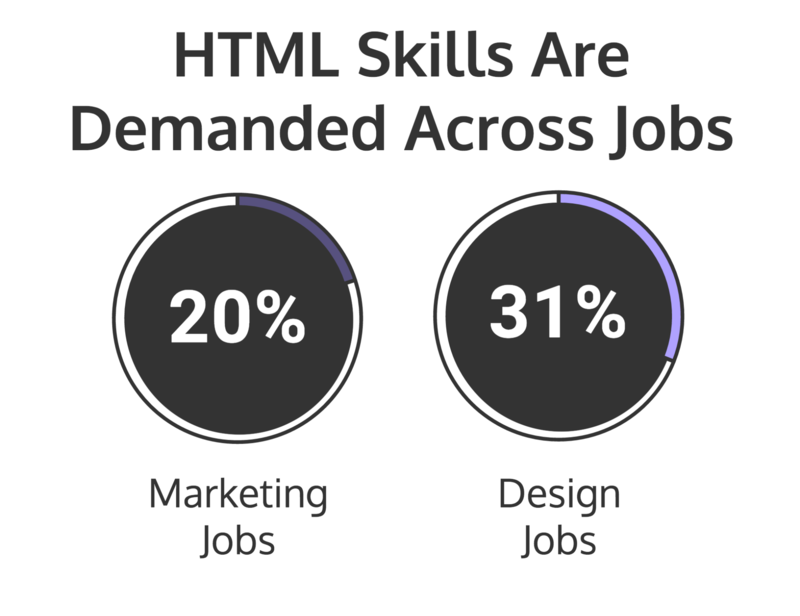 In the marketing job posts only about 20% of the companies wanted HTML, but in design job posts, more than 30% did. So almost one-third of all graphic design jobs would require you to know the basics of HTML. If not more. 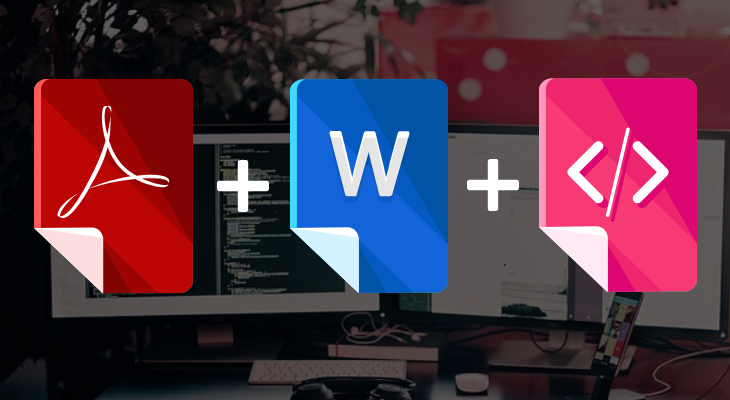 Now you won’t have to build a whole website from scratch. But if you know how to make minor fixes online, it could be huge. And help your resume stand out. What was a bit surprising was that the demand for HTML as a graphic design skill is not limited to only small companies and teams. 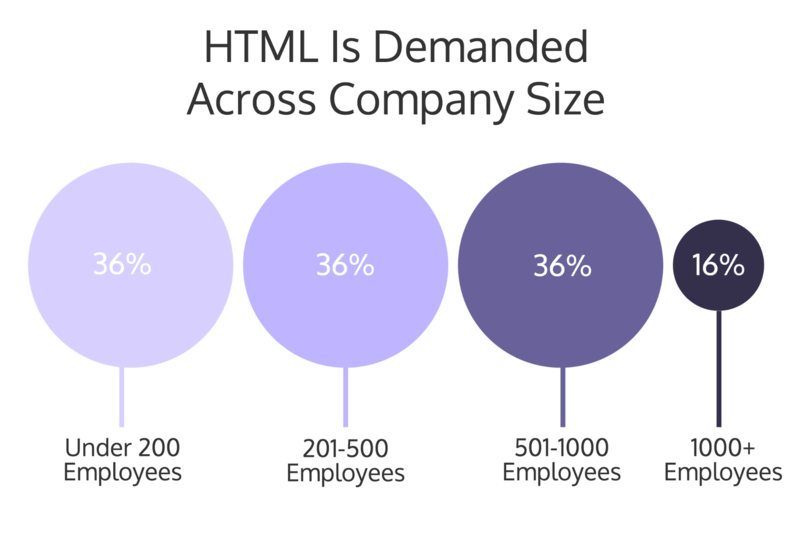 In fact, 36% of companies with less than 1000 employees want their graphic designers to know HTML. Although you may never use HTML at your next job, I would still brush up on the basics for the job hunting process. It is the small things can really help you stand out when a hundred other applications with the same graphic design skills that pass over a hiring manager’s desk. Now, if you are looking for a graphic design skill to focus on that will be worth it in the end, I would recommend UI/UX design. I mean Business Insider gave it one of the spots on its coveted list of top skills to have in 2017. This was not echoed in my research, though. 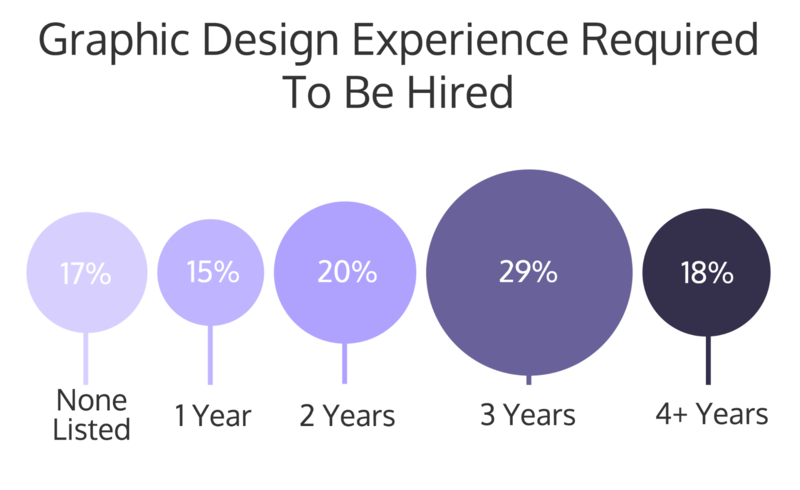 Only 13% of job postings wanted a graphic designer to have UI/UX experience. It was barely in the top 20 most popular graphic design skills out of the entire study. If this was any other skill, I would say avoid learning it because the demand seems pretty low. But if you want to be able to apply to these higher paying jobs, I would say you should start learning it. Because you can earn a nice chunk of extra money for having UI/UX design on your resume. As in $7k more than average. 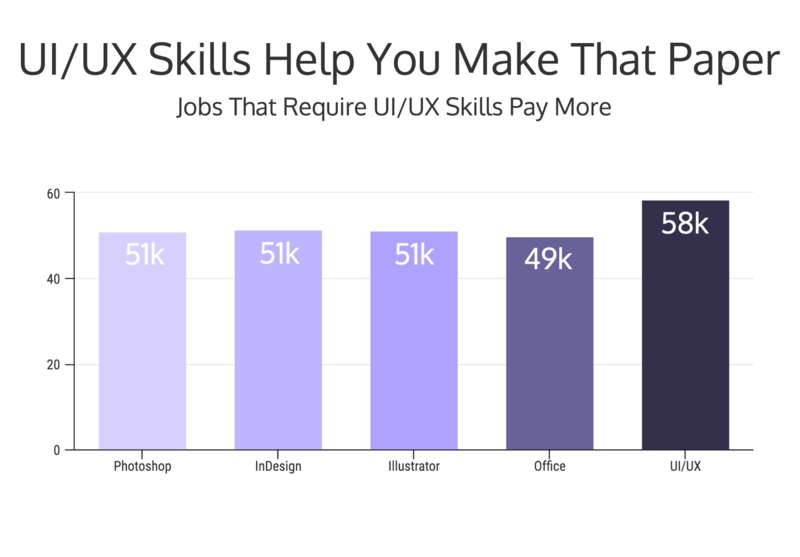 When I looked at the average salary for each skill, I found that those jobs that wanted UI/UX skills had a salary of $58k! 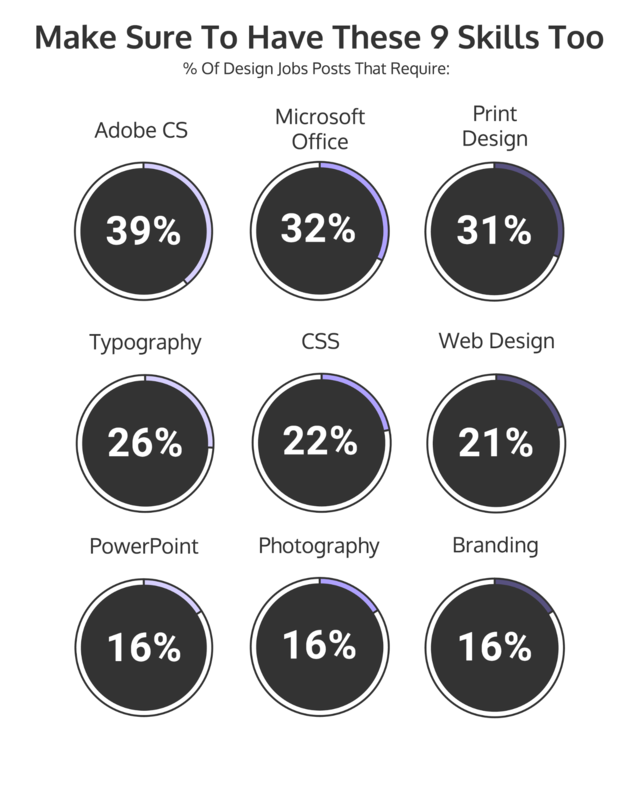 When you compare it to other popular graphic design skills based on salary, UI/UX skills blows the others out of the water. Photoshop, InDesign, and Illustrator all hovered around $51k, as well as HTML and Adobe CS. Microsoft Office dropped down to around $49k. So if you are looking to learn a graphic design skill that will help you make more money, UI/UX design is perfect. Now that we have hit on the most highly demanded graphic design skills, I will show some of the others that were highly demanded. Just remember that this does not include the skills that I covered above, like HTML, UI/UX Design, and the three Adobe programs. I think it would be safe to say that your resume or portfolio should include an example of each of the skills from above. Also, it is important to remember to pursue some of the graphic design skills that are in smaller demand. 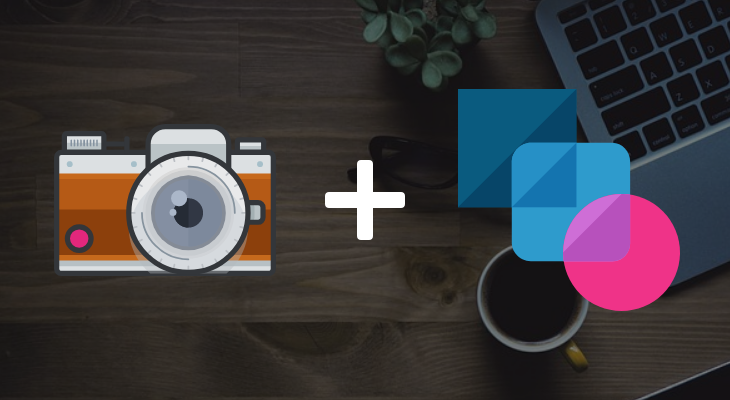 Like Photography, which was demanded by 16% of companies. In my marketing skills study, some of the skills barely broke the 20% demand threshold but were still very important. Even if hiring managers did not know how to properly convey this. It is quite difficult to get hiring managers on the same page with the team managers when it comes to what an ideal graphic designer, or really any hire, looks like. It is a tough thing to communicate! In fact, there were about 56 graphic design skills that were only mentioned once because of that disconnect. This is why I would still recommend that you show that you can use your branding or photography skills in your portfolio. And maybe make sure you know how to use Microsoft Office programs, especially PowerPoint. I mean, I think everyone who has used a computer in the last 20 years has experience with this. But if you are one of a handful of people that has not, it couldn’t hurt to brush up on all of the programs before you apply. Also, the amazing thing about learning all these graphic design skills, is the different kinds of jobs related to design that you can get. If you are looking for a career pivot then maybe becoming a graphic designer immediately is not for you. Unless you already have some past experience. If not, you better come back when you have it! Because almost every company I studied required some real-world experience in graphic design, in addition to the many graphic design skills listed. According to the data, 83% of all job posts required at least one year of experience, with the rest either not requiring experience, or omitting it from the text. And that was the bare minimum. Although the most requested was a minimum of three years, about 50% of the companies wanted between two and three years of experience. 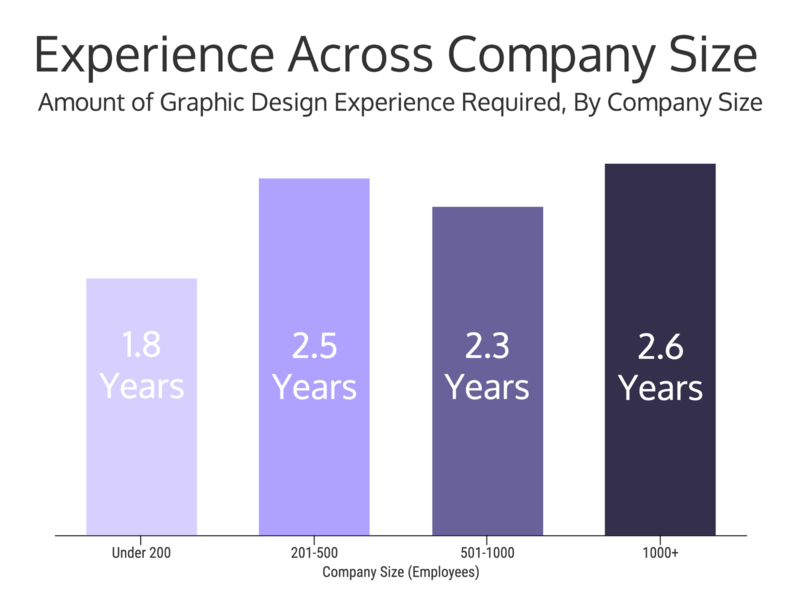 The average amount of experience required was around 2.33 years across the company sizes. And it followed an almost linear pattern as the company size increased. This gradual increase started at 1.8 years for companies with less than 200 employees and finally ending at 2.6 years for companies with over 1000 employees. This type of experience is not seen in other jobs, with a large chunk of marketing jobs I studied previously looking for people with minimal experience. But the good news is that the smaller the company, the better chance you have of being hired with little to none experience. Because about half of all the companies that did not overtly state that they require experience were under 200 employees. So even if you only have a bit of experience, but do have a stellar portfolio, you can find a job! 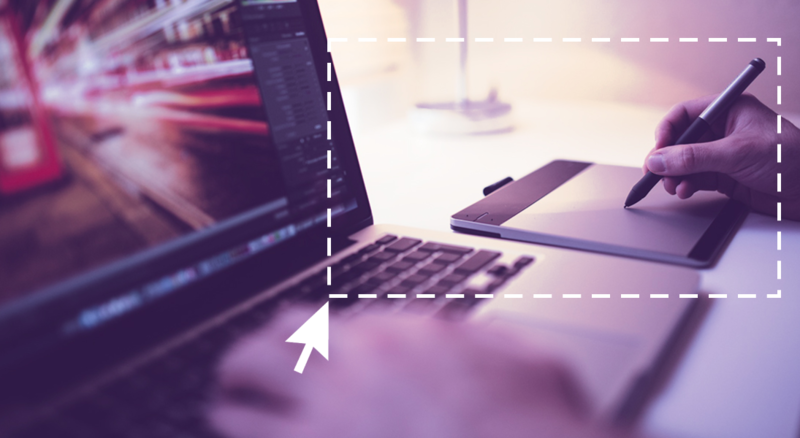 There are a number of online platforms that can help you get your design portfolio started. You can consider graphic design work for print on demand products such as t-shirt printing, blankets and even watches. Print on Demand, in case you’re not familiar, is a fast-growing industry where designers partner with third-party suppliers who can print their designs on a white label product when someone purchases it online. For instance, Teespring allows designers to upload their own designs and make money when someone purchases it from their site. Since it’s profitable, it becomes a side hustle that also develops your portfolio. The added bonus (on top of passive income) is that you can show prospective employers your knack for creating designs that people love. You may be able to get a design job with minimal experience but it probably won’t be one of the best-paying ones. And having too much experience can hurt you as well, which is an interesting phenomenon. 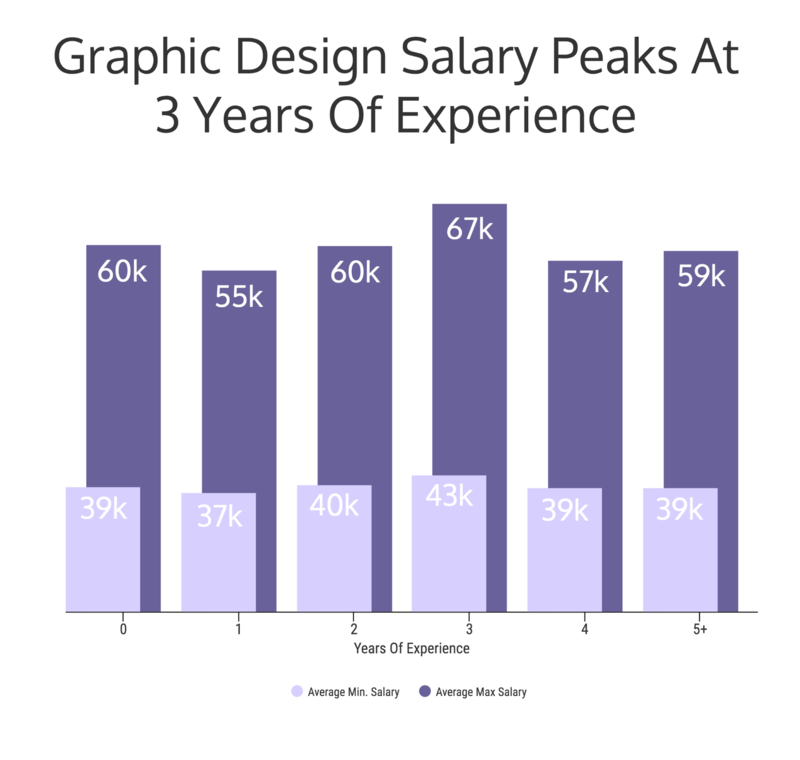 Actually, graphic design jobs that pay the best require at least three years of experience, with a midpoint salary of $55k on average. The average salary that we found for graphic designers is right in line with outside sources…even Glassdoor confirms it. Plus, about 30% of the companies that I studied wanted a minimum of three years of experience. So I would say that three years of experience is the perfect place to be when applying for jobs. 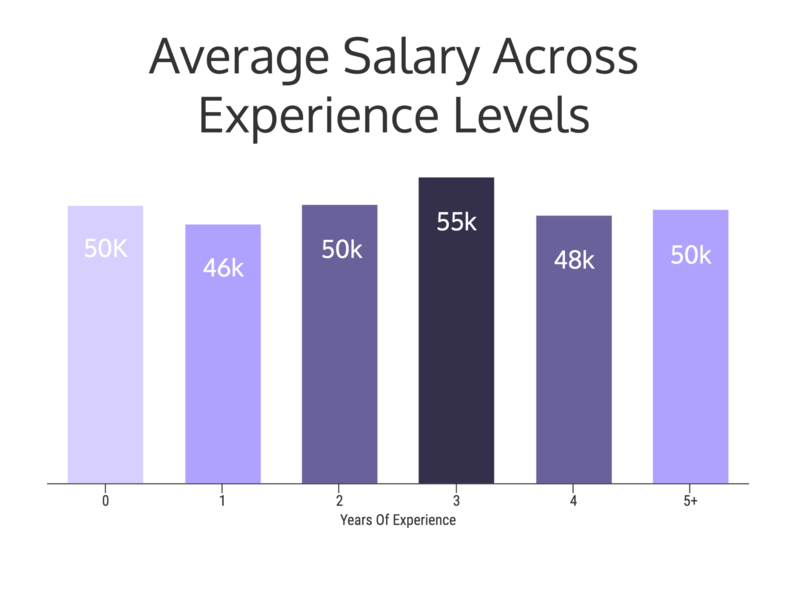 Jobs that want three years of experience have an average minimum salary at $43k or 8% more than the sample average. And an average maximum salary at $67k is about 10% more than the sample average. So, by getting just a few years of experience under your belt, you can increase your earning potential by between a minimum of $3k and a maximum of $7k each year. That is why I think getting this experience while you are in college or another job is essential. Because who does not want to earn more money? No one, that is who. If you have nothing but money on your mind, I would recommend applying to the larger companies. They will pay you on average a lot more than the smaller businesses or startups–which actually may be surprising to some, especially if you are in the startup or tech industry like I am. But alas, the companies with the biggest pockets will actually pay you the most for your graphic design skills. For example, companies with under 200 people pay about $3k less per year for the minimum salary when compared to those with 1000 employees. 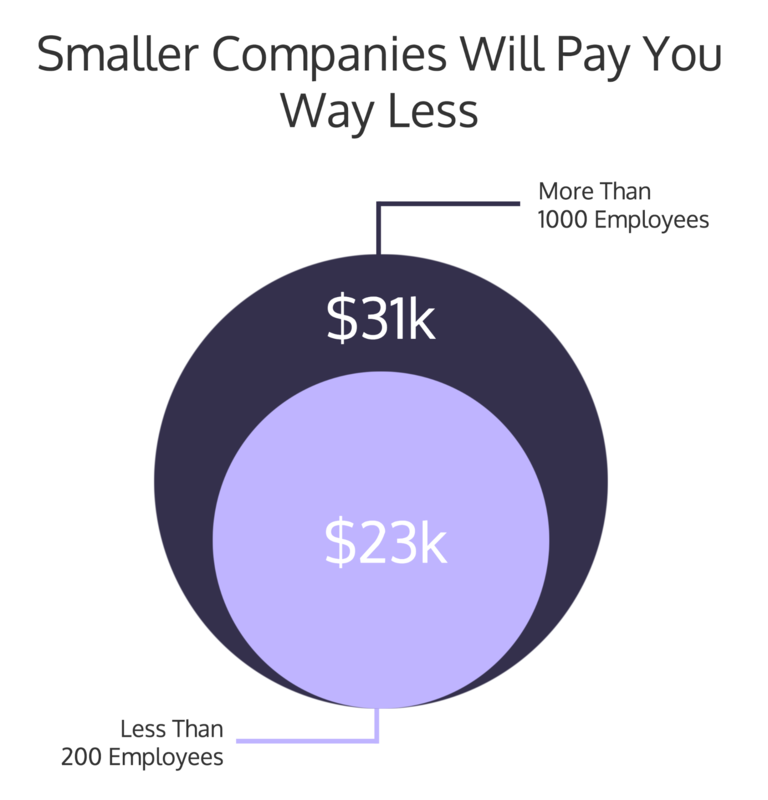 At the maximum, you could earn $5k more per year at a large company compared to the medium and small companies. That is a pretty big gap, for the exact same job. 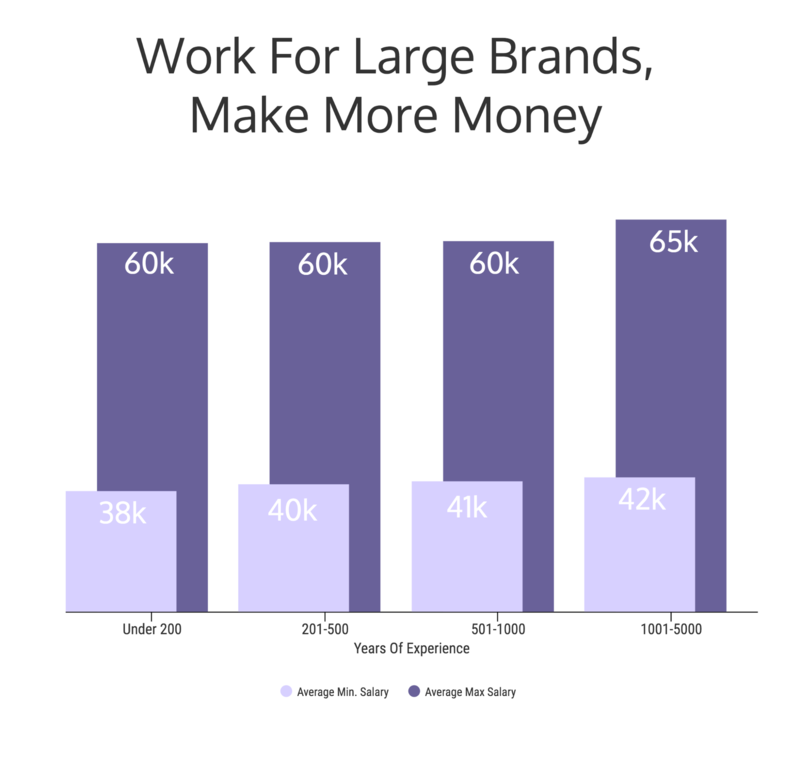 And compared to the average of the sample, those who would like to work at a company with less than 200 employees will make about $2k less a year. In fact, the smallest salary I found, $23k a year, came from a company with less than 200 employees. That is almost $8k less than the minimum salary you could make working at a company with more than 1000 employees! So if cash rules everything around you, I would recommend looking to work for the larger companies. But be sure to remember that smaller companies can offer more creative freedom and fun perks. Itching to apply to a large company after seeing how much more you can make? Well, there is one catch, and it’s kinda big. You must have a degree. Just having appropriate graphic design skills is not going to cut it this time. 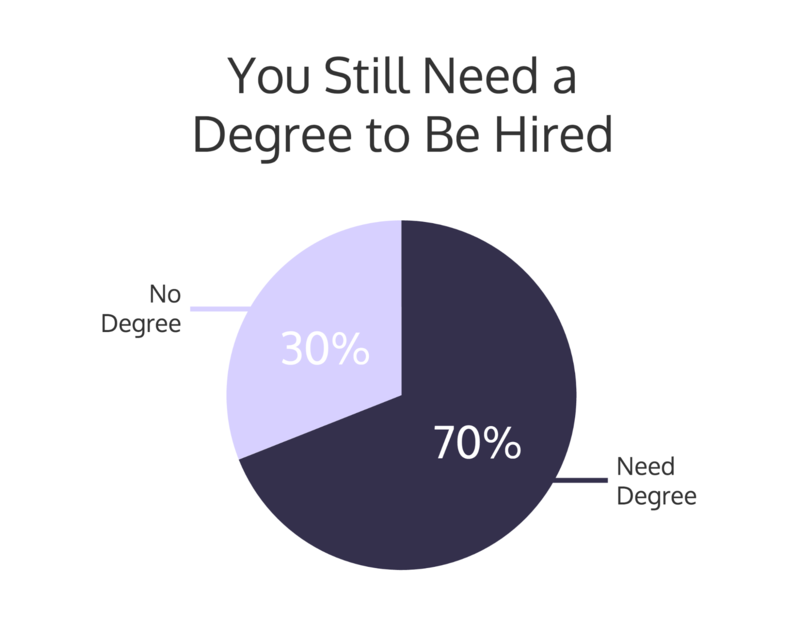 Almost 70% of the job posts that I studied suggested that the ideal candidate has a degree. And not just any degree–most wanted a bachelor’s degree in graphic design, web design or art, with the larger companies almost requiring it. 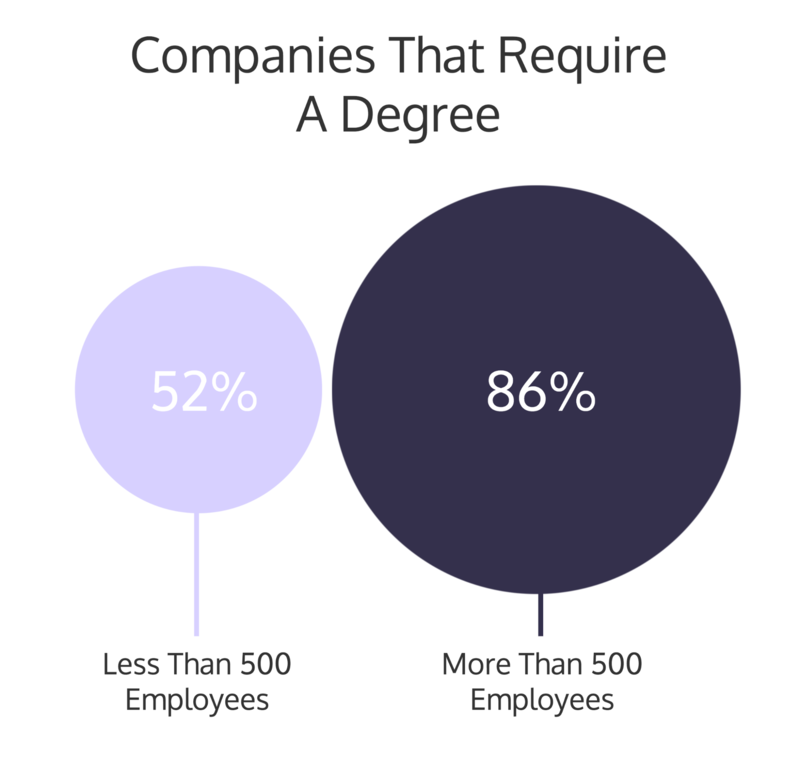 In fact, a college degree is essential if you want to work for 86% of brands with more than 500 employees. 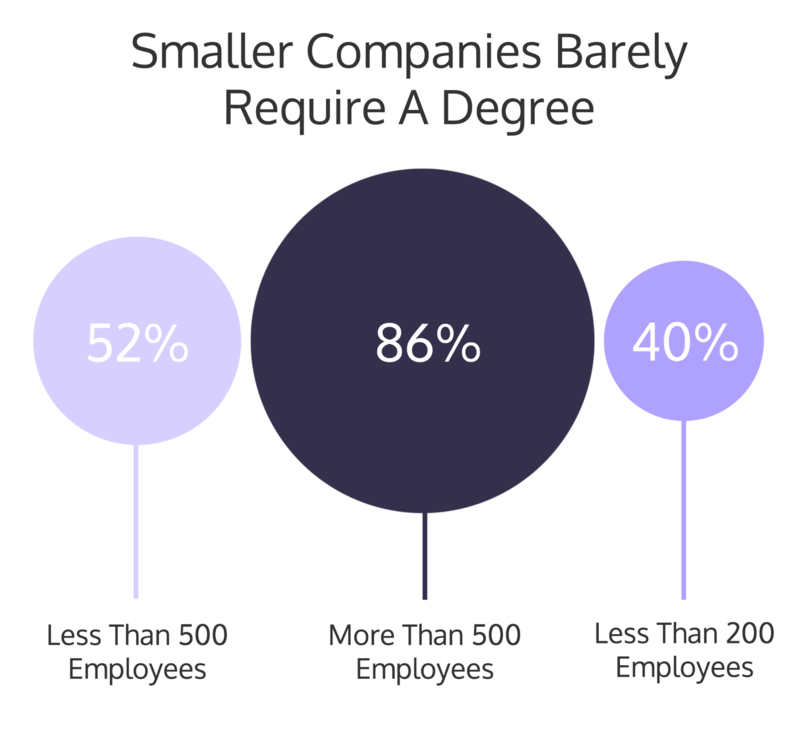 In contrast, only about 52% of companies that have less than 500 employees want their applicants to have a degree. And if you look at the companies with less than 200 employees, the rate drops even more–only 40% of those job posts mentioned a degree in their main body text. The smaller companies were the only ones that had more job postings that did not request a degree compared to those who did! So if you do not have a degree but do have some experience, I would recommend looking at the smaller companies first. Especially since 88% of those small companies require three years of experience or less! 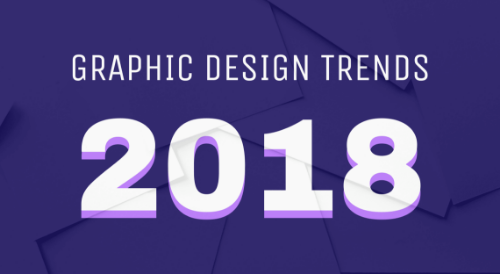 Honestly, I was a bit surprised when it came to what companies were looking for in their graphic designers in 2017.
Who would have guessed that so many companies required a college degree? I was not expecting that. Or that your salary starts to drop after you have three years of experience? Color me surprised. And there you have it. If you have any other questions, be sure to reach out in the comments!